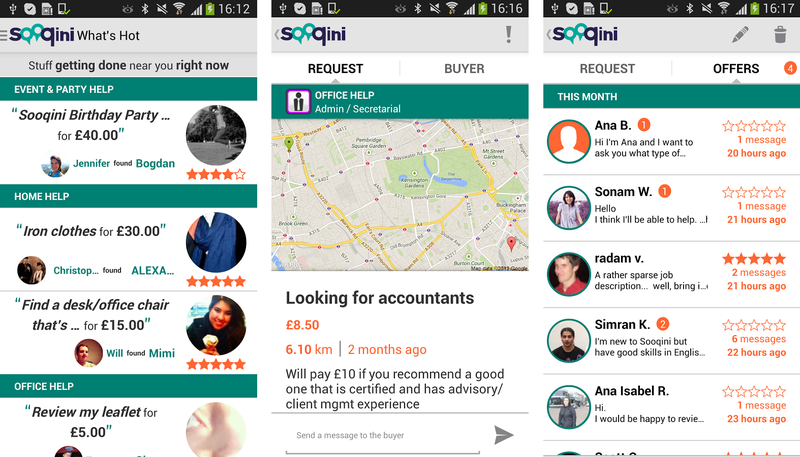 Sooqini, the UK-based marketplace for finding someone to help you with your errands, has launched its first app designed for Android smartphones and tablets. Announced today, the Android app provides Sooqini users with access to the company’s core tools for buying and offering a range of services while mirroring the design of the company’s website, which was relaunched in September. With the app, users can create a profile (or can log in via Facebook to cut down on this process), request help with tasks and browse other people’s requirements in the local area. It can also be used to set up alerts for new tasks that are posted in a user’s vicinity that match their criteria. Payment for services are made via PayPal. As well as releasing its first Android app since it launched in 2012, the company also updated its iOS app to fix bugs that had been causing problems on start up and preventing some people logging in via Facebook.